IPL, as it is largely believed, can make or break players and hence, their careers. With every season of the Indian Premier League that goes by, we have seen players reviving their careers after having been sidelined, or breaking into the national side for the first time. We have seen the likes of Jadeja, Ashwin, and Chahal getting a national call-up by virtue of their performance in the IPL. We have also been witness to players, like Watson and Raina, getting a recall into their respective national sides- all thanks to the IPL, and of course, their display of skills in the league. This IPL was no different. While some players despite having a great IPL this season were unlucky to get a call-up, some others were indeed rewarded for what was a promising performance in the eyes of the selectors. In this slideshow, we will gaze through five such players who were rewarded for their IPL performances. Siddharth Kaul had a good first half of the IPL for Sunrisers Hyderabad. 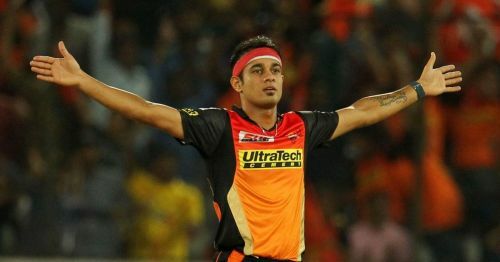 In a squad that has Bhuvneshwar Kumar in the attack, Siddarth Kaul managed to carve a space of his own, and ended the league with 21 wickets to his name, thus becoming the joint highest wicket-taker for Sunrisers, along with Rashid Khan, and the joint second highest wicket-taker overall. He was a part of the squad in all of their matches which is a reflection of his reliability. Kaul was definitely a standout and made more impact than Rashid in the first half of the tournament. His incisive spells led the selectors to believe in him, and when they met on May 8 to select ODI and T20I teams for UK tour, they decided that his performance was worth a call-up in both formats. The pacer did not look the same in the business end of the league and made people question his selection. He did give his side important breakthroughs in the first qualifier but, that was not enough. Come the final, his balls were again sent to tatters. We hope he will be able to recover his old form and justify his selection on the upcoming tour if and when he is inducted into the playing XI.